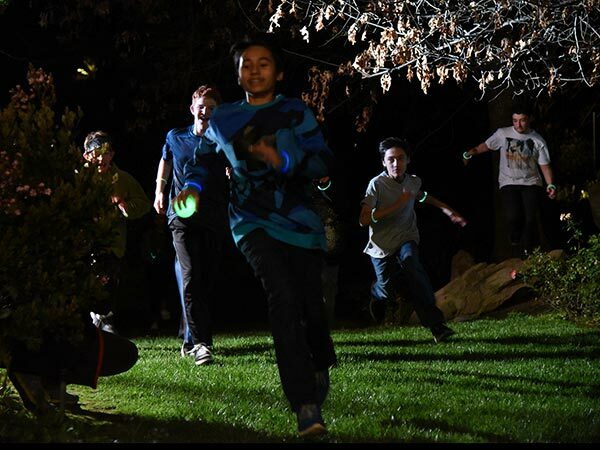 Capture the Flag REDUX – light up the dark for an outdoor adventure! 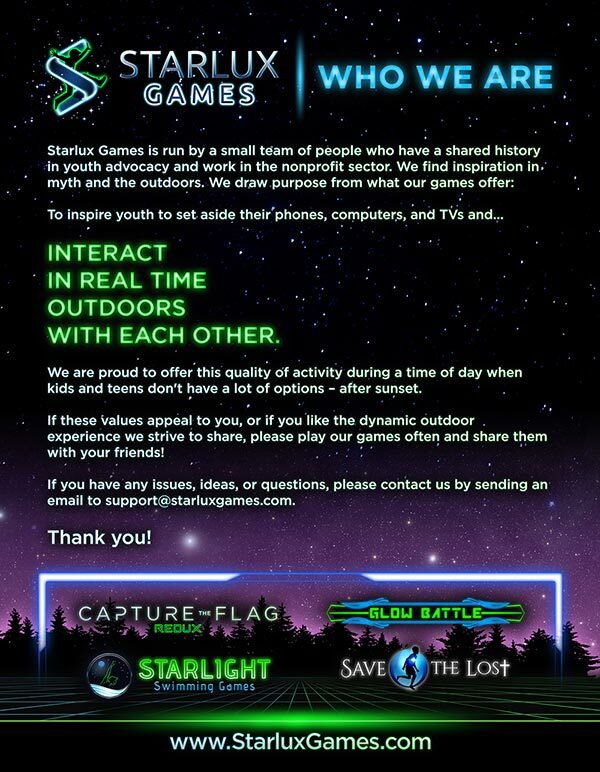 This game pumps up the excitement of the classic outdoor game Capture the Flag with glowing lights and new styles of play. Experience it anywhere with space to run — after sunset or inside with the lights off. Get youth off their phones and TVs – and outdoors being active! It ranges from 4-20+, depending on the game chosen. The kit includes enough game pieces to play the traditional Capture the Flag game with up to ten players but our game “Invader” is perfect for as few as four people while Treasure Thieves and Ninja both allow for twenty or more people to play. You also can purchase additional wristbands and our 3-way game kit to allow for even more players. If you want to play during the day, we recommend finding a safe and spacious indoor area where you can turn off the lights (such as a gymnasium). That said, you can still play outside during the day – all the game pieces will still be visible and functional – it just won’t be as visually dynamic as at night. 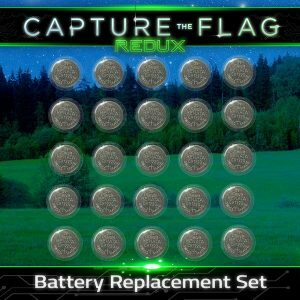 29 reviews for Capture the Flag REDUX – light up the dark for an outdoor adventure! We first played this game at a camp and were hooked! It is awesome for big groups so we got one for our future camping trips and for sleepovers. It’s a simple game with lots of detailed strategies though. Mix in the fitness benefits and you can’t go wrong. I guess I didn’t realize how much my family and I needed some more outdoor time. It is so easy to get stuck inside glued to a screen. I get on the kids for their phone use, but I was no better → watching football on the big screen for hours on Weekends. We all feel better after running around in the woods or the backyard for a couple hours playing CTF Redux. There is no replacement for exercise…. except fun-based exercise! And that’s what outdoor games like this have added to our family. For a couple of hours, I watch a group of teenagers running all over a park, united in their teamwork to defeat the opposing team. Remarkable to me was the fact that three or four of them had been socially somewhat excluded previously. Instantly, they became equal members of the team. That breakthrough for them continued later as they laughed and rehearsed how the game had gone. I’ve also talked to a number of families in my neighborhood who bought the game for a child’s birthday. Each recounted that the game was being played not only with their family but with others who live in the neighborhood. Especially, they talked about how it had been a long time since the family had had so much fun together. This game was really great! We played with our youth group and all the options made it a huge hit! Our orb was not working when we received it and they quickly sent us a new one! Great customer service!! I experienced this game being played amongst a large group of high schoolers. It’s a lot of fun! The way that the kids had to use strategy, teamwork, and athletic ability also shows that this game has a positive influence on their development. The glowing element is really unique and adds a lot to it. I was looking for a fun, outdoor activity to do with my youth group. They are a group of girls ages 10 and 11. The girls had so much fun and could’ve played for hours longer than we had time for. They really got into the game, and even played all of the different variations. The set up is really simple and the rules are easy to follow, even if you are not familiar with Capture the Flag. I think it’s safe to say that not only our family but any of our friends or extended family who have gotten to play this absolutely love it! Tons of exercise, laughter and great memories to be had whenever we play. It’s honestly really cool as a mom to be inside with the windows open and hearing everyone outside interacting, screaming and laughing their heads off. No cell phones, no TV, no electronics!! Yay!!!!!!!!!! Back in the day, my husband and I played lots of night games with our friends. It’s awesome to see that our kids are getting the same experience now but with super cool glow in the dark game pieces. There are several fun game variations that come with this and our favorites are, “Ghosts in the Graveyard, Traitor and the Zombie !” You know it’s a major hit when the kids don’t want to stop playing yet to open birthday presents and have cake and ice cream! 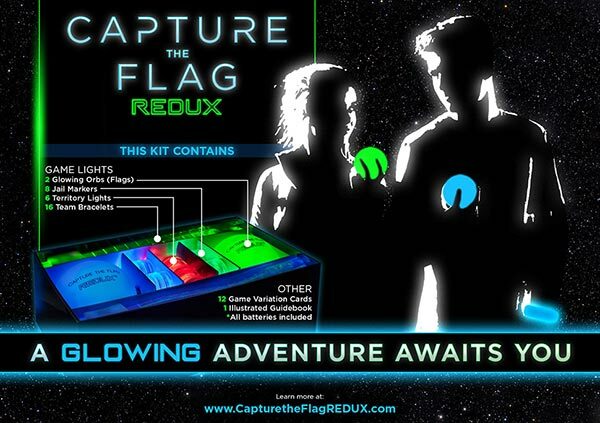 I was looking for a birthday gift for my ten-year-old twins that didn’t involve a screen or a plug, that’s when I came across Capture the Flag REDUX. So, I ordered it for them, and I’m so glad I did. They were so excited when they opened it and have loved it ever since. It was easy to set up and so much fun to play. It’s so great to see all of my kids from ages 7 to 20 playing it together, and it makes me happy to see them off of their screens and doing something active. And, they are having fun trying all of the game variations on the cards. The pieces have held up great and are still really bright even after a lot of use. We even played it in the snow with our neighbors! I’m thinking it would make a great birthday gift or Christmas gift for my nephews and nieces this year! My kids can’t wait to play this! We encourage the kids to stay off the electronics and get outside and play. We do a lot of camping and this is perfect gift. We tested the components right away and found one of the markers was disabled. REDUX quickly remedied it with no delay. Pros: Provides an awesome activity for the kids (and adults) at night. Cons: It’s best with a lot of players. All the pieces glow very bright and the game is easy to play. I recommend this for any outdoor event…it will keep the kids busy for hours! Playing Capture the Flag when I was a kid was a blast. 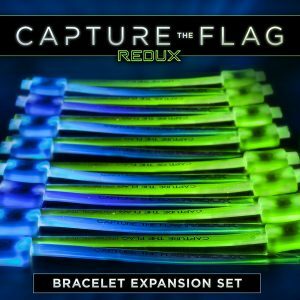 I recently got the Redux version of Capture the Flag this year and played it with a group of young men from my church. I can tell you that I am no way in shape, all had a blast and it brought me back to my glory days as a kid. I would totally recommend this to anyone that loves the game. I’ve only gotten to play this once so far, but it was a lot of fun! My friends and I in our 20s and 30s but you’re never too old to play, right?? We played the original version on the beach and it was pretty exhausting! (I’m not embarrassed to say I intentionally got caught once to catch my breath for a minute in jail – sorry team!). I’m excited to try out the expansions and playing in an environment with a few more obstructions… like the woods! Thinking this will be a great gift for my nephews, too. Absolutely a fantastic and fun game! My kids had a blast with their friends. They would play this every night. Definitely a great purchase and would recommend it to anyone. We did parents verse kids and everyone had so much fun. Fun for all ages!!!!!! I bought this game for my daughters (ages 7, 10 & 11) birthday party. To say it was a hit would be a huge understatement. They love playing capture the flag with their friends at night all summer long, this was such a cool version of it. The bracelets are high quality and fit the kids well. If you needed more than 8 per team you could always use glow bracelets. The other LED lights that make the ” jail ” and game borders are bright enough to clearly see in the grass. 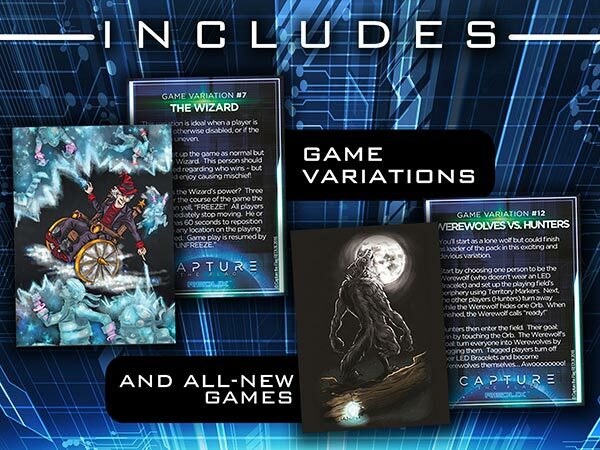 The kit also comes with a bunch of cards with game variations on it. The led globes that are the “flags” seem to be made well too. They were thrown around quite a bit in a game of keep away by the losing team. If your kids like capture the flag they will love this. Also the company that makes it is has one of the most responsive customer service people. The package I received was clearly tampered with in the mail, they got right back to me and expedited shipping on a new box so it would arrive before the party. The kids really had a blast. Because the ages of the boys were between 9-10 (and my one nephew who is 6), it was a bit unorganized, but the kids got so excited about having everything lit up. One of my favorite things about the product is how the all the lit up gear really transformed a boring night into an awesome, exciting night for the kids. They got so amped up when I started turning all the gear on. The bright orbs is a creative substitute for regular flags too. Being able to track the “flags” and all the kids without worrying about them running all around in the dark was pretty nice too. Overall I’m very satisfied with the product. I’m sure as the kids get older they’ll be able to play some of the more involved alternative playing styles. I bought this for the Military so they would have a fun game to play while they relaxed from a long day. The game is fun, and it keeps the group entertained for a while. People of all ages like it. Amazing good time! 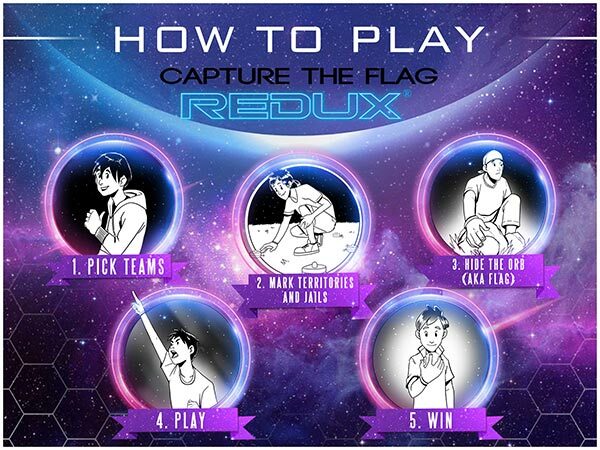 Capture the Flag REDUX is a cross between Capture the Flag, Kick the Can, Freeze Tag, and Cops & Robbers, all rolled into one adventure with a twist. To play, each adventurer must give up watching television or video games for the evening and instead head outside at night for a great evening of activity, strategy, friendship, safety, and socializing. My 11-year-old received the game for Christmas. Since that time, our fenced backyard has become the neighborhood meeting spot. At first, only kids in the 9 to 12-year-old range would come by, riding their bikes and throwing a football around until darkness took hold. Over the past month, the age range has expanded for kids from age 6 up through age 15 to join in the action. Further, I expect the trend to continue. Having just started on a new expansion Game Variation called Ninjas, this Variation actually sets up parameters to provide distinct team advantages vs. disadvantages. This is absolutely perfect as a solution to keeping the game exciting, challenging, and fair with a significant disparity in ages. The Ninjas Game Variation could not have come at a better time. I can legitimately say that our family has adopted the game into our weekend activities. When my 9-year-old has his birthday party in May, we did not go to a laser tag center, a bowling alley, a rock climbing wall, or an arcade. Instead, we set up a number of tents in the backyard, invited a number of neighbors to spend the night, and played Capture the Flag throughout the evening, with pizza and cake during breaks. While the kids were covered in LED lights for safety and to follow game rules, I simply spent a (fairly) quiet evening in the backyard hammock watching the fun. The impact of watching a large group of kids actively playing outside while having a blast completely obliterates any though of video games or television … it is a change in which I am proud to be a partner. This is truly a game changer (literally and metaphorically). So much fun! We played with a 20 kids and 6 adults in a gymnasium. It was a blast running around in the dark and trying to get a strategy together while being attacked by other team. This is a great way to get kids moving! The kids enjoyed this way more than the usual flashlight tag. We had a few bracelets break when they hit the hardwood gym floor, this may not be an issue when playing outside in the grass. The company is helpful and responded quickly when I needed to get more bracelets for a larger crowd. I was pleasantly surprised by how well this game was put together. My wife and I got it for our nieces since they have a big backyard and no shortage of energy. The game was ready right out of the box, requiring virtually no setup at all, and we had a ton of fun. And let’s face it, glowing lights are just cool. I bought two of these kits, one for a friend with 5 kids and for my own family of 3. I can honestly say that I love this modern version of capture the flag. I grew up playing this game with the neighborhood kids and later in scouts. It’s been so fun to watch the kids enjoy this game and in a safer fashion (the lights do a lot to ensure that kids don’t run into each other). I brought the game along to a family vacation in the mountains and we set it up one night on the edge of a field, near a wooded area. We had great fun, especially as we were able to take cover behind trees, bushes, and boulders in order to conceal our advances. My nieces and nephews especially enjoyed it. Highly recommended. I found this on thisiswhyimbroke.com (lol) while looking for a birthday gift for my soon-to-be 10 year old nephew. After reading the product description and other reviews, I figured this would make a good gift. However, I didn’t expect it to be his favorite gift! He LOVED it. Unbeknownst to me when purchasing it, capture the flag is a neighborhood and boy scout favorite for him. It turns out he went door-to-door in the neighborhood recruiting players and his mom said he was even trying to recruit the girls! (for a 10 year old boy, that was a big deal) Anyways, this is a great idea, I think reasonably priced, and I totally recommend it. We travel four states away each Christmas and have to travel with all of our gifts. We purchased a kit for each families cousins and they loved it! It has been a gift that spanned all the ages, was interesting to the boys and girls alike and is still being played by all this summer. It is also a favorite of my own kids to take to sleepovers! Well worth the money! At the beginning the kids thought it was hopeless. Luckily they had the fastest runner of the group on their team. At first the kids went to get the flag, and the parents were tagging all over the place. When there were only a couple of kids left the parents decided to go for the flag. Sadly they were blinded by their success so far in the game, they did not remember that the fastest runner was still free on the kids’ team! The parents were dead meat. They got tagged before they could reach the flag. The student had become the sensei. The kids won and they have not let the parents forget it! The parents did not cheat, and boy did we pay for it! This game was the highlight of the year for parents and kids. The game is great for school age kids, teens, and their parents too! It really is a great time! Thanks for the hours of outdoor fun! My dad got a kit by being a Kickstarter backer. So my family all played it, my siblings and their kids. It was AWESOME!!! Not only did we adults have a blast, but the kids were having so much fun that it lead to one problem: the kids didn’t want to go to bed! In fact, they were so upset when we told them that we’d only play one more game that a couple kids (6 or 7 years old) boycotted the last game to try to get us to keep playing (the rationale wasn’t readily apparent to us, but, hey, kid logic…). Not only was it bedtime for the little ones, but the adults were exhausted! We even tried to make things more equal between kids and adults (we played with a mixture of each on both teams) by requiring adults to always be carrying a beverage. It was so much fun that I got my own kit! I highly recommend this as a way to get kids active. Kids (and apparently adults, too) LOVE night games! 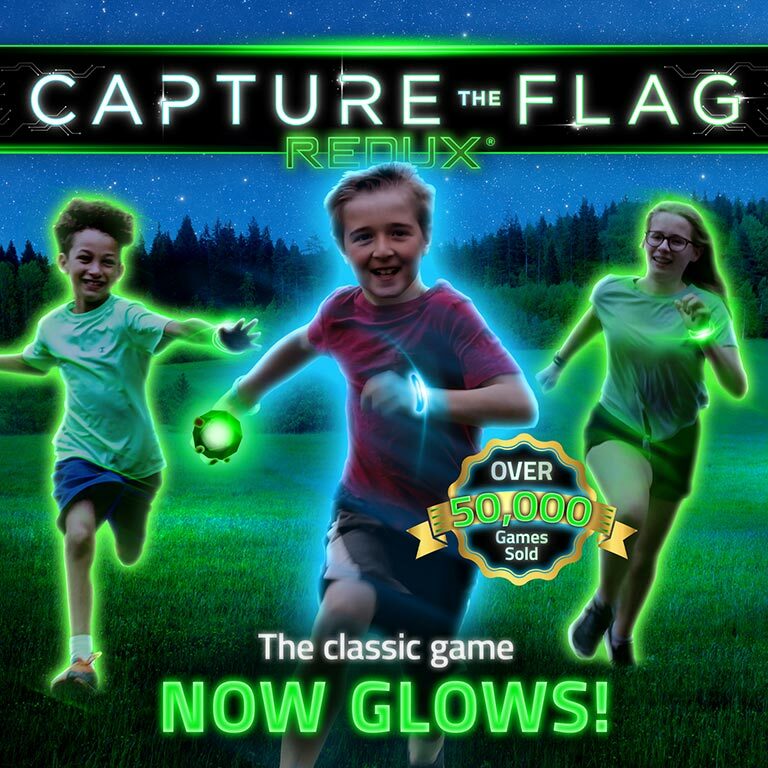 Anyone who has ever played the classic game of capture the flag knows what fun it can be, and this product makes it possible for kids to be chasing and hiding in utter darkness. How cool is that! The game comes with a variety of ingenious glow-in-the-dark and light-up apparatuses. My kids have used the kit several times so far, and it goes without a hitch. 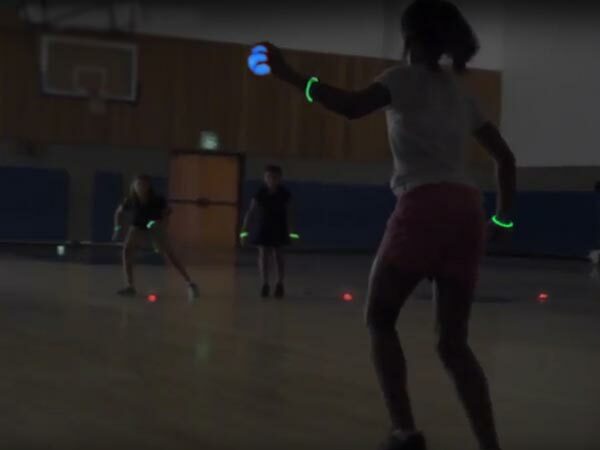 They can set up boundaries, designate jails, and arrange teams with different colored glow-in-the-dark wrist bands, and begin playing the game in minutes. The clear markers for boundaries and teams cut down on arguments (which any parent can appreciate). So far, the only issue we’ve had so far is that one of the orbs doesn’t seem to light up as bright as the other, but that’s a very minor issue. All in all, it is a great product that does everything you could ask it to, and makes an already fun game even more entertaining! We got this game for our son’s tenth birthday party and then hosted a boys vs. dads game of Capture the Flag. The fun was WAY more than any of us bargained for!! The glow-in-the-dark aspect of this game takes the thrill of the experience to the next level! Both the ten-year-olds and the forty-year-olds LOVED it!! I HIGHLY, HIGHLY recommend!! First — I love this game. End of story. Go buy it. You’ll love it and have it for years to come. Second — I rarely leave reviews. I actually bought my game through a friend who is friends with the creator. This is an independently developed and manufactured game, so every bit of word-of-mouth helps! Apparently this is the brainchild of a former Boy Scout and current filmmaker in LA, so it’s very cool. Since he doesn’t have the advertising budget of the mega-big-guys, I figure I’d help out and leave a review for you nice folks. I bought the game in LA, after playing at a friend’s Memorial Day BBQ. Super-fun. Kinda felt bad, because I think it was supposed to be for the little kids, but if you give a crew of 30-somethings a keg + this game = awesomeness and hilarity!! Best time ever. I took my game to NYC for a family BBQ (I heart BBQs), and again… awesomeness. What was fun was the different environments! In LA, we played up in a huge backyard near Ventura so it was very much a drunk-falling-touch game. In NYC, it was a street game. No rough housing, well less rough-housing, ’cause no one wants to kiss pavement — but it still rocked! I ended up leaving my box behind for my sister + family. An LED enhanced version of the greatest game of all time. With indefinite sets of multi-hour youth group engagement (managment), various game instructions to keep things fresh, and the versatility to entertain 6 to 60 year olds hour on end.. what’s not to like?! This game is a blast to play outdoors in the dark! Love the creative game suggestions, too. What a cool, fun idea!